Most frequently used for ripping and cross cutting, our table saws can also be used for various other jobs like taper cutting, tenoning and dado cutting (subject to suitability of the saw, arbor size and blade size). We sell a range of table saws to suit your job requirements and budget. Our range includes the following types. Site Saws - sheet metal top with assembled legs. Suitable for trade and DIY applications, primarily repetitive ripping and crosscutting with a primary emphasis on portability. Contractor's Saws - these are workshop saws with cast tops and assembled legs that are suitable for most DIY applications and light duty production work. Cabinet Saws - these are heavier duty workshop saws with cast tops and cabinet bases that add greater weight, stability and rigidity. Suitable for heavy duty applications. Most of these machines can also be configured with a sliding table assembly. 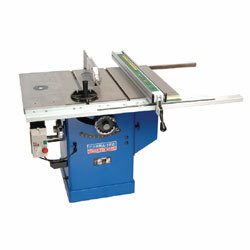 To have a look at our range of table saws, click here.